As you all may know my family loves to read, well my kiddos and I do. Not so much my hubby. My boys get upset when I am sick because that means no bed time story! I use to read them short books and we would finish them within 10 minutes. Now that they are older they like when I read them longer chapter books. Every night I sit on the chair in their room and read. We are always excited to see what is happening next to our favorite characters. Some of our favorites are of course the classics. But my boys also love the newer books too, like Captain Underpants, The I survived series, Goosebumps and they also love Dog Man. 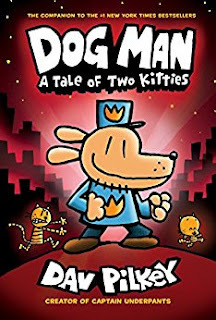 Our newest book is Dog Man: A Tale of Two Kitties. Now even though we are only a few pages in my boys already love it. It happens to be book 3 in the series. So they were already pretty much in love with Dog Man and his adventures. He was the best of dogs... He was the worst of dogs... It was the age of invention... It was the season of surprise... It was the eve of supa sadness... It was the dawn of hope... Dog Man, the newest hero from the creator of Captain Underpants, hasn't always been a paws-itive addition to the police force. While he can muzzle miscreants, he tends to leave a slick of slobber in his wake! This time, Petey the cat's dragged in a tiny bit of trouble -- a double in the form of a super-cute kitten. Dog Man will have to work twice as hard to bust these furballs and remain top dog! As always my kids giggle non stop when I read. Of course as mom I have to give each character their own voice. For my kids this just adds so much more fun!! I know it is a good book when my boys beg me "Please mom one more page PLEASEEEEE" and of course I give in and read another page. The book arrived just a few days ago and I have a winter cold! I was able to read the first night, but by night two my throat was sore. My oldest son (Brandon) came to me and asked if he could please read to me and Quinn (my youngest). I smiled and said of course. My son read the book just like I do, he even tried to make the same voices I make. I couldn't stop smiling! One because he voice was cute and two because I realized just how much they love the little things I do when we read. He even made faces, I never knew this, but my kiddos informed me that when I read to them I make a lot of facial expressions. And after I read a page I always turn to show them the photos. 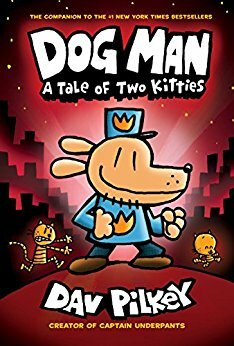 In Dog Man we LOVE the comics and A Tale of Two Kitties is FILLED with them!! And like I said we are only a pages in, but this book has us giggling and hanging on the edge of our seat to see what happens next. I cannot wait to see how Dog Man handles this new super cute threat! If you have a little one that just seems not to be into reading, you def. want to check out graphic novels. Not only do you get them reading, but they seem to like it more. I think because of the comic book type feeling.